I like this site a lot- the best way to find out about it is to just go there - however, for the record - the organisers - Tyne and Wear Archives and Museums - have this to say. 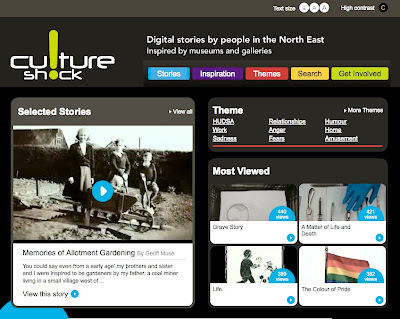 "Culture Shock is a two year project which aims to collect 1,000 digital stories from people across the North East of England. The project will explore the diverse heritage of individuals, groups and communities living in the region, by encouraging 1,000 people to create their own digital stories inspired by museums and galleries collections. By creating these stories we want to promote a greater awareness and understanding of diverse communities in the North East by encouraging people from similar and different backgrounds to explore, document and share their heritage with each other and the wider North East community. What will happen to my digital story? The 1,000 completed stories will be added to museum collections for future generations to enjoy and to help make collections more relevant to the North East community. At the end of the project a touring exhibition featuring the digital stories will take place at museums and venues across the region. In addition a selection of digital stories will be showcased at a number of public broadcasts in the North East. The digital stories will also be used in future interpretation, exhibitions, loans boxes and reminiscence packs by museums...."
This is Chris Batt's 'myberspace' come to fruition yes? hi! i've just found you're blog, thanks for the mention! i'd be quite interested to hear your thoughts on the National Digital Forum, the line up looks great!